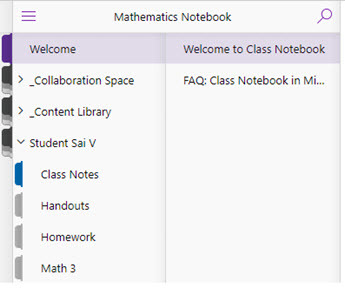 Visit the Fix notebooks page on OneNote.com. Select Fix Permissions beside the notebook people are having trouble with. When you see Permissions Fixed, their access will be restored. If they still can’t see the Collaboration Space, look for the section group in the notebook pane. If it’s not located beneath Welcome, right-click on the section group and select Move. Select the notebook name as its destination and select Move. Once it is back in its spot at the top, students and staff will see it again. Note: OneNote for Windows 10 doesn't require these updates. Why this happens: The Collaboration Space has special permissions that allow you full control and read-write permissions for everyone else. When the permissions get interrupted (like when a section group is moved) Class and Staff Notebooks protect themselves by automatically locking down the Collaboration Space. While it’s locked down, those who share the notebook can’t see it. The Collaboration Space and its content are still there and will reappear when permissions are fixed and the section group is placed in the right spot.